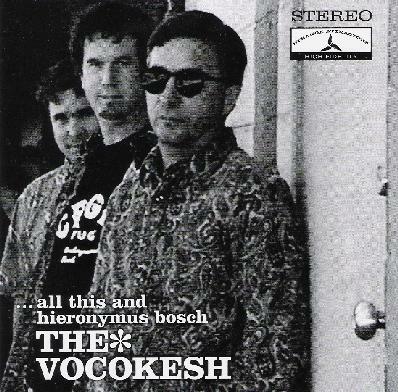 The Vocokesh - "…All This and Hieronymus Bosch"
Vocokesh are back, once again on the Strange Attractors label and once again rocking out in the deepest of cosmic space. We've got founder Richard Franecki on guitar, bass, sitar and harmonica, John Helwig on lead guitar and Rusty on drums, plus guests Doug Pearson on Wiard synthesizer and Hal McGee on electronics. All This and Hieronymus Bosch is deeeeep space from start to finish. Tracks like "Gazing at the Dust", "Eddie's Freakout", "Vibe #8" and "Eddie Makes an Exit" are all total psychedelic trips, bringing together eastern raga sitar and wailing, jamming, meandering spaced out mindfuck guitar. Like Lamp of the Universe meets Black Sun Ensemble. And the later two include some of the most smoking guitar solos on the album. "Once More Near the Beginning" and "John's Fuzz Theme" are space rock n roll tunes reminiscent of classic F/i, ST 37 and of course Vocokesh themselves. "The Truth Regarding Sunspots" and "Standing in the Ruins" are crushing stoner psychedelic space excursions with mind blowing lysergic guitars. "Blue Light Dharma Shuffle" is equally tripped out, with harmonica adding an interesting bluesy edge to the music. And the title track is another one with blues harmonica, though it's also another of the album's primo acid space journeys, with cool synth embellishments from Doug Pearson. And at 9 minutes it's also the longest track of the set, just settling into a groove and exploring deep, stoned rocking space. As far as heavy space rocking psychedelia goes, you'd be hard pressed to do better than this. All the standard psychedelic descriptive terms apply here… mind-melting, lysergic, you name it, it applies. Franecki and Helwig's guitars complement each other beautifully. Both have their own style and character and take the music in different directions, yet it all balances out in the end. And except for the title track I completely forgot they had guests on electronics, as it's not easily detectable. This is a GUITAR lovers album. I think this may well be my favorite Vocokesh album yet. For more information you can visit the Vocokesh web site at: http://www.myspace.com/97463333.